Have you ever read D.H Lawrence’s poem The Snake? It is one of my favorite descriptions as to how we react to these creatures, the fear and fascination. Google it. Dawn is right – they are AT LEAST as scared of us as we are of them, and they have much more reason to be. Trust me, a lot more snakes are killed (for no reason at all, often) by humans than humans ever are by snakes, and usually the snake has a good reason (like “You are about to step on me”). BTW I am not saying “so wander around barefoot and oblivious in rattlesnake areas” – But pay attention and dress appropriately, then NO ONE has to die. What a beautiful bullsnake! In North Carolina we have their relative the pine snake. The genus Pituophis (bullsnakes, pine snakes, gopher snakes) is characterized by a modified epiglottis. This allows the snakes of that genus to make the loud hissing sound they are known for. Despite their menacing sound, they are generally quite docile. I adore all animals, but I don’t think there is a more beautiful creature than the snake. Thank you for sharing! L ~ wow, I am impressed you can tell it is a bull snake just from its face! TIL what an epiglottis is, thank you Lauren. +2 gold stars from me! He is a beautiful snake and I love the way he is hiding himself within the leaves! 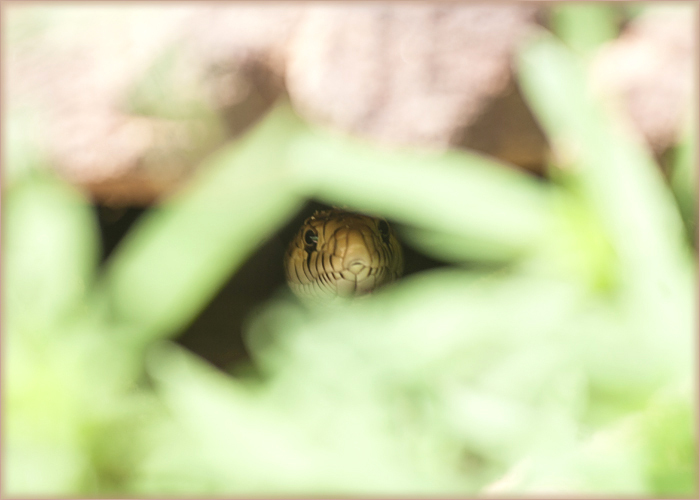 heeeere lil snakey snake. leave it to you s~ to post a cuteness overload pic with a snake. i know all you shreve fans would never do this.. but please tell all your friends not to kill snakes this summer for no apparent reason other than you fear them. sorry.. it’s just a issue that really makes me angry. rawr! Beautiful photo! I used to be very afraid of snakes but the older I get the more I appreciate their beauty. I live in the Mojave desert and hike in rattlesnake territory. It’s been one of my wishes to come upon a rattlesnake but I haven’t yet. I agree with the others – snakes should not be killed out of fear. Awwww very cute picture!!! Thanks for sharing!! The snake looks afraid. I know he/she is safe with you! Awesome! Snakes, like spiders and wolves (and coyotes) have gotten a bad rap. I think you’ve told us before, but the bullsnake is good at controlling rodent pests so he’s probably a little helper on the farm – providing he can’t get to your chickens. It’s egg laying time, do you think this is a female laying her clutch? I’ve had many over the years. Had one named Oscar that liked riding around inside my shirt for hours at a time- Put him on your shoulders, and he’d dive right in! They he would make himself comfy and poke his head out to watch the world go by from either in front, down at my throat- Or work his way around back and look over my shoulder. Or climb up the back of my head for the crow’s nest view. Great photo Shreve! He/she is a very cute snake. Too cool! Omg, that little snake face is actually really cute! ha ha! So alert-looking. The round pupils make it look like a little turtle kinda. Either a bull snake or a gopher. Color suggests a gopher. Have had both as pets. Nice snakes and good to have around on a farm. Neither will bother the chickens except for maybe chicks .. and eggs. Both will eat eggs if they can get to them so I hope you don’t mind occasionally sharing. They will eat many more rats and mice than eggs. yeah, looks like a turtle head! nice photo. I get them around my squash plants. :) One of my dogs would hide in them, too.